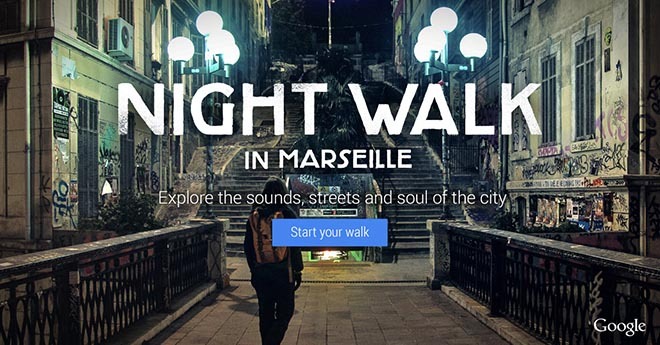 Google’s Night Walk in Marseille experience has won the Grand Prix for Digital at the Epica Awards. Launched in April 2014, the digital experience showcases Google Maps and Google Search technology. The Google Story film at the heart of the campaign follows French woman Julie Muer as she explores the streets of Marseilles, documenting the places and people she discovers along the way, to create ‘Promenades Sonores’. The digital interactive experience, online at nightwalk.withgoogle.com, invites people from around the world to join Julie on an interactive Streetview tour of the city at night. Users use Google Maps to experience one of Julie’s walks through the neighbourhoods of Marseille, taking in 360 degree panoramic views, read facts about the city from Google and watch live performances of musicians playing on the streets, and artists creating wall murals. The Google Night Walk in Marseille campaign was developed at Google Creative Lab by executive creative director Steve Vranakis, director of consumer marketing Graham Bednash, senior creative David Bruno, and at 72andSunny Amsterdam by executive creative director Carlo Cavallone, creative directors Gregg Clampffer, Micky Coyne, art director Patric Franz, copywriter Yann Corlay, copywriters Rosa Rankin-Gee and Harriet Lye, executive producer Sanne Drogtrop, creative technologist Gabor Szalatnyai, group brand director Mike Goller, brand director Naomi Bartle, director of strategy Stephanie Newman and strategist Carsten Pruijs. Filming was produced at Epoch Films London by Lucid Inc (director Anna Sandilands and director of photography Ewan McNicol), executive producer Rob Godbold, producers David Knox and Phil McCluney. Post production was done at Gramercy Park Studios London by producer Kit Lawson, colourist ben Rogers, Flame artist Steve Miller. Music is “Swing in Minor” by Django Reinhardt and Stéphane Grappelli. Digital production was done at MediaMonks Amsterdam by producer Xander Amo and interactive director Jeroen van de Meer. Digital content was produced at Brenninkmeijer & Issaacs Amsterdam by director Joe Roberts, director of photography David Liddell, 360 degree director of photography Martijn Baudoin, producer Chantal Gulpers, sound engineer Jaap Sijben.